Accudata’s GVM-10 is ideal for EHO’s who need to measure ground-borne vibration arising from: civil engineering works, quarrying, railways, road traffic or demolition. It will meet in full the requirements outlined in the British Standards BS 5228-Part 2:2009+A1:2014 and BS 7385-Part 2:1993. 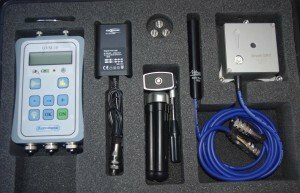 The GVM-10 is very well made, highly accurate and is very easy to set up and use, having a single range measuring Peak Particle Velocity from 0.03mm/s up to 200mm/s and air over-pressure from 100 to 148dB unweighted linear peak. It is supplied in a good quality carrying case containing: tri-axial geophone sensor with 2m cable, three ground spikes, air over-pressure microphone with 2m cable and a tripod, battery charger, user guide, USB memory stick with analysis software, full manual and calibration certificate from an independent European laboratory. The seismograph has two modes of operation. Continuous (bar-graph) mode for use during civil engineering works and Trigger (waveform) mode used to capture single events like a quarry blast. After switching on, a single key push is all that is needed to begin monitoring with results displayed on screen and updated every two seconds. Data are stored on an SD card able to hold hundreds of records before it is necessary to download it. The supplied software can produce report ready output from each event with an option to export data to a spreadsheet or a pdf file.